Mid-morning on Sunday 13th September 2015 I joined David and Avril Haines at the Stoer Head Lighthouse car-park. They were conducting the third and final day of Whale and Dolphin Conservation’s ‘Big Watch Weekend’, albeit with the sea so rough that any sightings of cetaceans were very unlikely. Part of their brief for the weekend was to log observations of other plant and animal life in the vicinity; my contribution was to confirm some of their plant sightings. David and I walked over to the cliff-top south-west of the car-park, with our clothes flapping vigorously in the wind. We inspected the hummocky ground fissured by the trenches and burrows of a large field vole colony and then clambered down to the shingle beach at Geodh’Gainmhich (NC003324). Just above the uppermost edge of the shingle were a couple of tussocks of a stout, spiky sedge, which I was able to identify as false fox-sedge Carex otrubae. The only local record of this sedge is from the northern shore of Soyea Island (NC047219), where Pat and I found it, new to Assynt, on 25th September 1999. 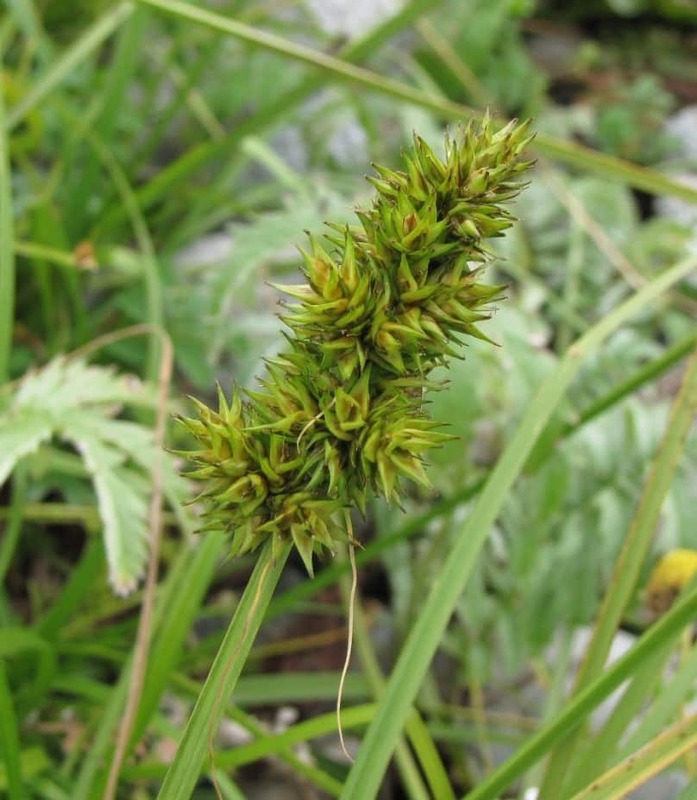 False fox-sedge occurs in damp situations through lowland England, but becomes almost exclusively coastal in Scotland. There are a few scattered records north from Assynt to Kinlochbervie, and by a curious coincidence I had found it the previous Saturday on Calbha Beag, an island at the mouth of Loch Cairn Bhain (NC1537). Other species of note on or above the beach at Geodh’Gainmhich included a well-grazed plant of the supposedly poisonous hemlock water-dropwort Oenanthe crocata and a tiny specimen of chaffweed Anagallis minima.